Playing in the major leagues was an on-again/off-again proposition for the man listed in all baseball record books and databases as Yip Owens. Frank Walter Owens’s first game in professional baseball was in 1905 for the Boston Americans, on September 11. It was his only game that year; he then went to the Southern Association to play for the Memphis Egyptians for the next three years, 1906 through 1908. Where did the nickname Yip come from? We have been able to find only a couple of references to Yip Owens, both more than five years after he’d finished playing in the majors. It’s entirely possible those were mistakes, confusing him with another man of a similar name, Frank Malcolm Owen, who pitched in the American League starting in 1901 and was a 21-game winner both in 1904 and 1905 for the White Sox. Frank Malcolm Owen came from Ypsilanti, Michigan, and understandably did get the nickname Yip used occasionally in print during his career. When Frank Owens the catcher came along just a few years later, he may have picked up the name when he arrived – or it may simply be a mistake. Such mistakes were made; Owen – the pitcher – was frequently referred to as Owens (with the “s”) in print at the time. And there are times when Owens was referred to as Owen. A baseball historian or two, some of whom seem to have gone a little out of their way to assign nicknames to players, may have featured Yip as a name for catcher Owens just because they liked the name. Frank Walter Owens was born in Toronto, Ontario, on January 25, 1886. i His father, John Owens, was a carpenter, according to the 1891 Census of Canada, and he and his wife, Elizabeth (Morrison) Owens, had five children. Frank was the youngest of the five. He was 19 years old when he debuted for Boston in 1905. Boston released Owens the following February, reported in the February 17, 1906, issue of Sporting Life. He soon found a job with the Memphis Egyptians of the Southern Association (for $140 per month) and caught for the Egyptians during spring training. Owens caught 73 games for Memphis in 1906, 59 games in 1907, and 117 games in 1908, batting .229 over the course of the three seasons. His salary increased to $175 and then to $200 per month in 1908. The White Sox traveled to California and back for spring training; Owens played a role beating the Los Angeles Angels in a game at Pasadena. On April 7 he played against his former team in Memphis, and his seventh-inning single drove in the only run of the game as Chicago beat Memphis, 1-0. The White Sox now featured an Owen/Owens battery. Pitcher Frank Malcolm Owen was in the last year of the seven he pitched for the White Sox, and catcher Frank Owens was now sometimes the man to catch him, at least in the preseason. Was this a big-league team with two Yips? Owens served as the backup catcher for Billy Sullivan, earning the designation on April 12. ix Sporting Life editor W.A. Phelon wrote that the White Sox had been “made much stronger by the fact that young Mr. Owens has shown himself an excellent relief for Sullivan and fully able to take care of himself both with the mask and with the willow.” x Owens was often paired with Chicago pitcher Big Ed Walsh (a 40-game winner in 1908) because of his ability to handle “Walsh’s great curves and shoots with superb skill and throws to bases like a rifle shot.” xi Billy Sullivan was the manager, 34 years old in 1909, and glad to have the support. Owens appeared in 64 games, batting .201 (not bad for a catcher in the era –Sullivan’s lifetime average was .213), and driving in 17 runs, one more than Sullivan, who played in 97 games. His reported salary was $1,800 for the season. Did our man ever catch pitcher Owen in a major-league game? Yes. There were only three games in which pitcher Owen pitched in 1909. In two of them, there was an Owen/Owens battery. The first game was on May 5, and it was indeed Frank Owen on the mound and Frank Owens behind the plate. The White Sox beat the Indians in Cleveland, 6-5, a complete-game win for pitcher Owen. Lardner referred to the pitcher as Yip Owen and the catcher as Catcher Owens. The pitcher singled in four at-bats; the catcher was hitless. On May 8, still in Cleveland, neither Owen nor Owens started the game. After the Indians had taken an 8-3 lead after five innings, pitcher Owen threw the final four frames. Sullivan caught until Cravath pinch-hit for him in the top of the eighth. Catcher Owens caught pitcher Owen in the bottom of the eighth. On May 12 – pitcher Owen’s last game – both men were in the same game, but not as a working battery. Owen pitched only into the fifth inning and that was to batterymate Billy Sullivan. Catcher Owens entered the game after Sullivan had been pinch-hit for in the eighth. On May 21 Comiskey sold pitcher Owen’s contract to Toledo. After the homestand ended on September 14, Owens was going to be left in Chicago when the team went out for its final road trip, but at the last minute Sullivan brought him along. The Tigers won the pennant and the White Sox finished fourth, 20 games out of first place. There was a postseason city series between the Cubs and the White Sox, and a game in which Owens played (a bit in center field, too) against the city’s Logan Squares team on October 17. In the top of the ninth, Owens scored the winning run in the 2-1 game. White Sox owner Charles Comiskey had his men travel to California again in the spring of 1910, and Owens contracted tonsillitis in Sacramento. On March 28 Comiskey announced that Owens had been released to the Minneapolis Millers of the American Association. Minneapolis would become home to Owens for ten seasons, interrupted by two more forays into major-league ball. He played in 100 games for the Millers in 1910, batting .189 and slugging only .223. 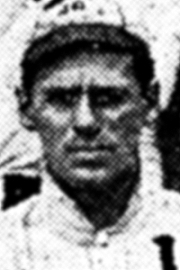 The team won the American Association pennant under first-year manager Joe Cantillon. At the end of the 1910 season, Owens was drafted by the Boston Nationals, but nothing came of it. Back again with the Millers in 1911, Owens appeared in 126 games and hit .273, with five homers helping drive his slugging percentage up to .387. In 1912 he hit .240 and in 1913 hit .247. Under the management of Pongo Joe Cantillon, the Millers (owned by Joe’s brother Mike) won the American Association pennant again in 1911 and in 1912, and finished second in 1913. They won it again in 1915. The new league needed to make inroads, and on January 23 or 24 Owens signed a three-year contract with the Federal League (the Boston Globe reported he would receive a bonus of $2,500). He played for the Brooklyn Tip-Tops. Though he was initially slated to be Brooklyn’s main catcher, Grover Land proved superior and got more playing time. And Owens suffered a broken finger in Kansas City on August 18, effectively ending his season. Owens played in 58 games, batting .277 and driving in 20 runs. In 1915 the Baltimore Terrapins “obtained” (the nature of the transaction is unknown) Owens from Brooklyn. xiv He played in 99 games for Baltimore, batting .251 with 28 RBIs. The biggest of those RBIs may have been the tenth-inning homer he hit on May 5 in Baltimore against the Chicago Whales. The score was tied 3-3 after nine innings. Chicago failed to score in the top of the tenth, and the hour was getting late; it was 6:30 P.M. by the time Owens took his place at bat. The Terrapins had two outs. Owens hit the ball over the center-field fence to win the game. Baltimore finished last in the Federal League standings. And the league was unable to continue in operation after 1915. Owens returned to Minneapolis and played the next five seasons for the Millers, playing the majority of the games in 1916, 1917, and 1919, and averaging just under 50 games in 1918 and 1920. In 1921 Frank Owens managed in Missouri as skipper of the St. Joseph Saints in the Class A Western League. The team finished fifth in the eight-team league. He also played in 52 games, catching in 46 of them, and batted .319. He returned to Minneapolis in 1922 for his last season in baseball, still playing for Joe Cantillon and hitting just .119 in 24 games. Minneapolis is where Owens made his home. He worked as a salesman and guard at a war plant after leaving the game. And it is where he died of anoxia in Fairview Hospital after a gastrointestinal hemorrhage, on July 2, 1958. There was also cirrhosis of the liver. He is buried at Lakewood Cemetery, Minneapolis. “The Yipper is gone and with him sweet memories of the glory ranks of Minneapolis’ greatest baseball era. These ranks are thinner because Yip Owens was the all-time Miller catcher by a considerable margin, when you consider durability and reliability. “Yip and Hobe Ferris wielded bats it would take two husky small boys to drag along the ground. In various years Owens led the league in fielding percentage and in putouts. You gain an idea of his span when you realize he was a leader in 1901 and again in 1919, for this warrior was a 10-year Miller. He was survived by his wife, Helen (Winslow) Owens, and their two daughters and five grandchildren, as well as his brother Lew of Toronto and their sisters Minnie and Mae, also of Toronto. In addition to the sources noted in this biography, the author also accessed Owens’ player file from the National Baseball Hall of Fame, the Encyclopedia of Minor League Baseball , Retrosheet.org, and Baseball-Reference.com. Thanks to the Minneapolis Public Library for supplying Owens’ obituary from the Minneapolis Star. i Standard sources show Frank Owens’ date of birth as January 26, but the date of the 25th is indicated in a register of births in Toronto, by Owens’s draft registration at the time of the First World War, and on his death certificate. iii Letter in Owens’s player file at the National Baseball Hall of Fame Library. iv Boston Globe, September 12, 1905.
v Chicago Tribune, September 28, 1908.
vi Sporting Life, October 10, 1908.
vii Chicago Tribune, January 24, 1909.
viii Chicago Tribune, April 17, 1909.
ix Chicago Tribune, April 13, 1909.
x Sporting Life, June 26, 1909.
xi Sporting Life, June 26, 1909.
xii Washington Post, September 16, 1913.
xiii Washington Post, January 14, 1914.
xiv New York Times, March 14, 1915.
xv Sporting Life, August 28, 1915.
xvi Minneapolis Star, July 3, 1958.